OKEECHOBEE, Fla. – This time last year, young Bryan Thrift of Shelby, N.C., fished his first Stren Series event as a co-angler on Lake Okeechobee and finished 11th. Then he went to the next Stren Series (formerly EverStart Series) Southeast Division event on Santee Cooper in March and won it. Thrift traveled to the third event of the season at Lake Eufaula and won again, collecting unprecedented back-to-back co-angler wins in the Stren Series. He finished the season with a 69th-place finish at West Point and a second in the Southeast points race; Thrift decided it was time to step up to the pro side in 2006. Today, on the Stren Series stage in the Wal-Mart parking lot, Bryan Thrift, fishing his first event as a pro, found himself locked up squarely between the local Lane brothers – Bobby and Arnie. 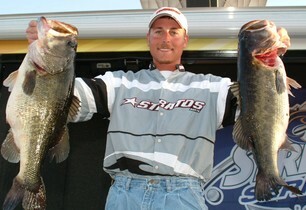 Arnie Lane had just weighed in an impressive 16 pounds, 14 ounces to take the lead. Whispers among locals in the crowd indicated that Bobby Lane had a big sack, too. It looked to be a showdown between the Lane brothers. But not before a shy Thrift took the stage and dropped 22 pounds, 7 ounces on the scales, anchored by two giant bass, both in the 8- to 9-pound class. Thrift knocked Arnie off the lead, and then Bobby mounted a crowd-rousing charge with 18 pounds, 9 ounces – but it wasn’t enough. Bobby Lane came up just 5 ounces short of his first Stren Series win and Thrift won his third Stren Series title in just five tournaments. For the record, Thrift amassed a two-day total of 36 pounds, 9 ounces for the win. For four days, Thrift fished a 3/8-ounce Chatterbait (made by Rad Lures in South Carolina) with the revolutionary new EZ SkirtTM in various colors in the Moonshine Bay area of Okeechobee. He fished the bait on 30-pound-test braided line. Thrift targeted a mix of hydrilla and reeds with the unique swimming jig that features a bill-like blade in the front, which produces an erratic action. Thrift also noted that all his big fish came first thing in the morning each day. This morning, Thrift did not have a big bite by 8:30. In fact, he didn’t have any bites by 8:30. Thrift collected a fully rigged Ranger Boat plus $10,000 for his win. Needless to say, it looks like FLW Outdoors has a new fishing phenom on its hands.